Log homes move and settle like no other buildings. That’s why Timber-Tec Chinking is engineered for zero shrinkage while accommodating up to 400% elongation so that as your house moves it will continue to be tightly sealed against the weather. 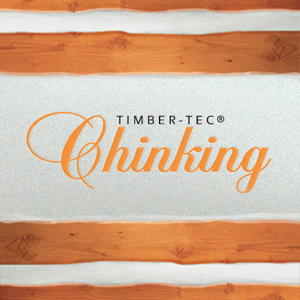 Timber-Tec Chinking is odorless, cures to exposure in just one hour, and is easy to apply even in cold temperatures. Because of its extreme elasticity, Timber-Tec Chinking won’t shrink and pull away from your logs; your log home will look beautiful and remain tightly sealed. View the Timber-Tec Chinking Product Data Sheet (PDF) for information about application, preparation, maintenance, and more.